Macarons have been my favourite-est sugary dessert since… 8 years ago (time flies).. back when they were unknown in SG, then the “macaron wave” hit our shores, and now they are not that popular anymore. My first PH was from Tokyo (did you know that the first PH boutique is in Tokyo?) and his macarons changed the way I approach flavours and dessert. I realised that the most outrageous flavour combinations can taste really good, and that food can be very “controversial” (I argued with someone about white truffle in macarons, and foie gras macarons before haha). 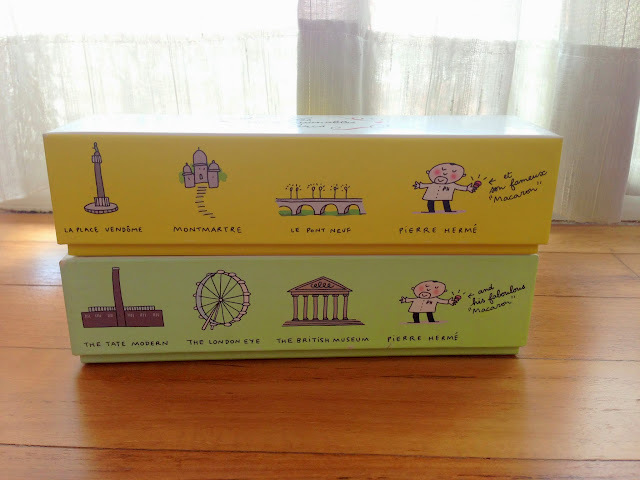 Even if you are indifferent to macarons, or you dislike macarons (horrors), you must admit that this is a very pretty box. The plastic insert helped to keep the macarons pristine, as if they were just packed. My friend bought me the blue circular box of macs from Paris before and a number of them got crushed! Because PH macarons are very moist, I would suggest that you freeze them if you are not consuming them immediately. I love that his shells are tender and soft (they don’t stick to the teeth) and they have a super thin and brittle macaron shell crust. Technique aside, PH does some crazy, befuddling flavour combinations. I’ve tried their white truffle & hazelnut, Huile D’Olive et Vanille (vanilla and olive oil), métissé (carrot, orange and cinnamon) etc. In this box, the flavours are more “normal” but still, very unique. The foodies went nuts over jasmine (white); a macaron which had the light, dreamy fragrance of jasmine flowers distilled into a creamy ganache. The Jardin du Sultan (orange and brown) is a new addition to the Les Jardins collection- orange blossom, candied orange, and coffee. He didn’t push the acidity of orange, and this went well with the mellow coffee notes. I enjoyed Céleste, a combination of strawberry, rhubarb, and passionfruit. It tasted more of passionfruit than a combination of flavours (I missed the acidity of rhubarb), but that was fine with me. I previously had the chuao (blackcurrant+ chocolate) macaron but never a pure cassis macaron, as pictured here. This was really yummy. Loved the bright, acidic flavour, and its gorgeous deep lilac hue. I think it’s my favourite of the lot! And then, there is Montebello– nutty pistachio ganache meets raspberry compote. So far I’ve tried only one other pistachio-raspberry combi (from Maple & Market; theirs also had rose) and this is the IT flavour combi of the year for me. There are classics that you MUST get if it’s your first time at PH. His Porcelana dark chocolate (yes! the only single origin chocolate macaron I know), rose ( I love the lightness of the rose, which is also one of the few PH macarons that uses a buttercream, and not a white chocolate ganache. Grab the Ispahan version if it’s available! Usually, Ispahan is only available as a big mac. ), vanilla (a combination of three kinds of vanilla, no kidding. The variant of this is his creme brulee macaron. ), salted caramel, and mogador (passionfruit and milk chocolate, one of his earliest flavour combis that is loved by all) are some of them.